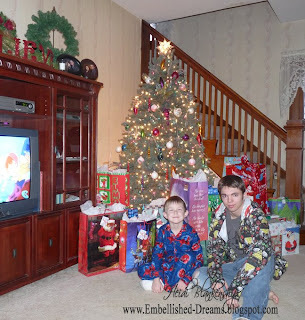 Ok, I'm back with a few pictures to share of our Christmas. 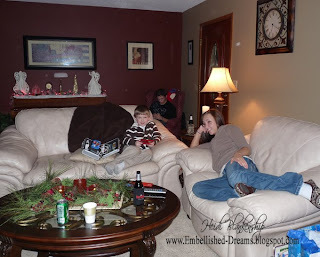 The pictures include all three Christmas celebrations, our house, my parent's home and my aunt and uncle's home. 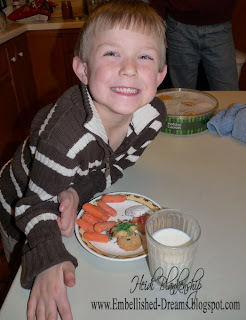 Getting a plate of cookies and carrots ready for Santa and Rudolph. Look at this!! 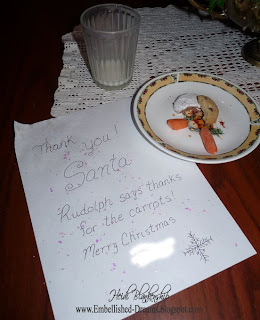 I note from Santa!!! Christmas morning. 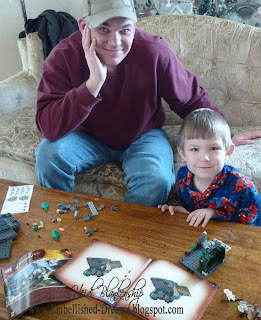 Lots of LEGOS for Christmas! Over at mom and dad's. 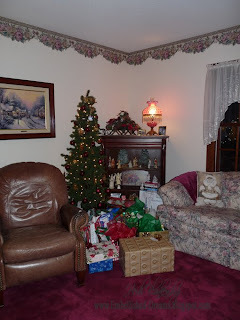 I Love my parent's home and I think it looks even more beautiful during Christmas. A little nap time. The next few pictures are from my aunt and uncle's house. From L-->R Uncle, Aunt, my Mom, Grandma, Grandpa and my Dad. Last year one of my aunts wrapped up a rooster head as a gag gift and guess who got it--ME!! So I thought it was time for Mr. Rooster to reappear. 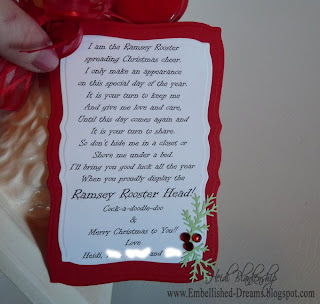 DH wrote a cute little poem to go with Mr. Rooster and I made the tag. One of my cousin's was the lucky one this year!! LOL!! Thank you for stopping by and I hope you all have a wonderful week!! 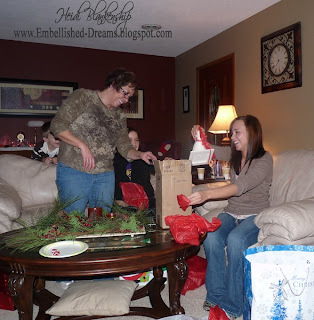 I decided to take a little break from blogging over the holidays and now I am trying to get back into the groove. I hope you all had a wonderful Christmas holiday and Santa was good to you!! 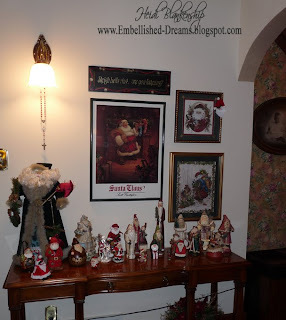 We had three different Christmas celebrations, I will be back after a little while and post some pictures from our Christmas. I know after the holidays many people like to send Thank You notes maybe for a gift that was given or for time spent together. Living in MN I know it will be a LONG time before I see any signs of Spring so I thought why not make some thank you notes in spring colors. I made a set of six thank you notes in pretty pastel colors with CS from CTMH and some designer paper from Basic Grey. 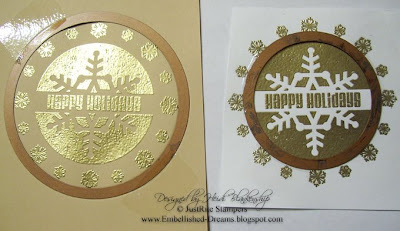 I also used a CB embossing folder and sanded the paper to show the white core. I sanded all of the paper for these note cards including the DP from Basic Grey. Then I added some pink Prima flowers with a button in the center of each. 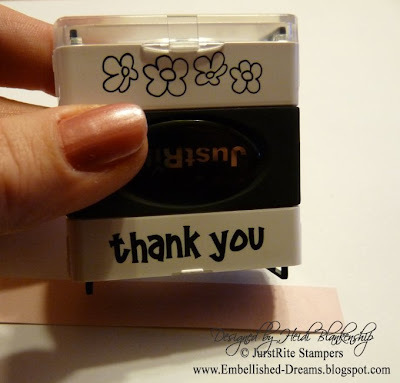 The Thank You sentiment is one of the 2x Stampers from JustRite Stampers. The 2x Stampers are double sided and pre-inked. 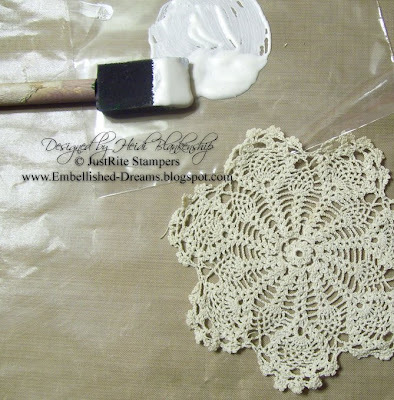 No stamp pad needed and they are very easy to use. One end has a sentiment and the other end has an image that can be used alone, as a border or a background. 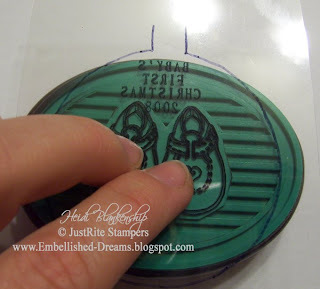 Another thing that I really like about the 2x Stampers is that on the sides they have little grooves to help you easily line up the stamp. 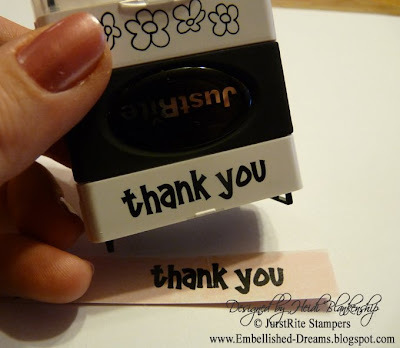 You just line up the stamp and gently push down for a perfectly inked sentiment or image every time! What could be better than that!? 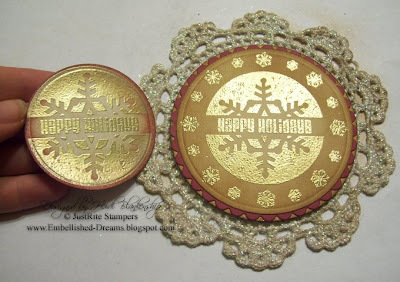 How about a Fabulous SALE on these and other stamps from JustRite Stampers!! That's right, it's time to make room for all of the new 2009 products and JustRite Stampers is having a HUGE SALE!!! BONUS BUYS AND DOLLAR DEALS--all of the details can be found by clicking HERE. Be sure to check it out!! Thanks so much for stopping by today!! Happy Holidays and I hope you are staying nice and toasty warm! Here is a little something that is sweet and quick for a last minute baby gift. 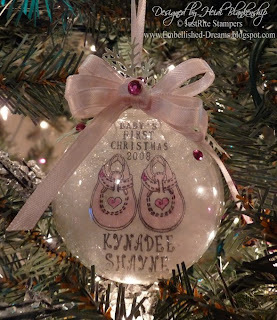 Who wouldn't love a personalized baby's 1st Christmas ornament? 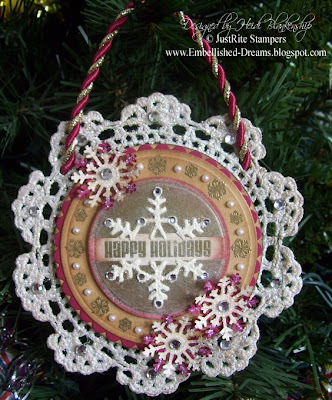 I used three different stamp sets from JustRite Stampers to create this little Christmas ornament, Small Letter Set for Round Monogram Stampers, Baby Stamp Ensemble and Curlz Paper Crafting Font Ensemble. 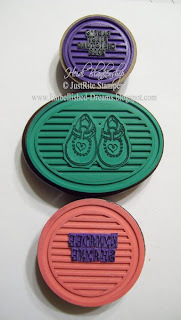 With JustRite Stampers the font sets come in three different sizes, 94pt. 50pt. 25pt which make them perfect for personalizing an item of any size. The Curlz Paper Crafting Font Ensemble also comes with numbers and symbols in the three different sizes for a TOTAL of 237 characters!! Stamps~JustRite Stampers--Small Letter Set for Round Monogram Stampers, Baby Stamp Ensemble, Curlz Paper Crafting Font Ensemble**I also used these wooden stamp mounts From JustRite Stampers along with the stamp sets--Harmony Classic Circle I 1-5/8", Harmony Classic Circle II 2-5/16", Harmony Classic Oval Stamper II 2-1/4" x 3-1/16"
Other~Clear Glass Christmas Ornaments, Acetate, Sharpie Markers, Crystal Effects, Ultra Fine Glitter, Snow, Martha Stewart Punch, Pink Rhinestones. Don't forget to check out the JustRite Stampers website for some amazing deals!! JustRite Stampers is offering DOLLAR DEALS while supplies last and also some wonderful BONUS BUYS!!! So, are you all ready for Christmas? 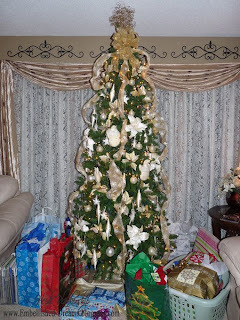 I know we still have a ton of presents to wrap and even some to buy!! I have been sick for a while now and every time I start to think I'm feeling better it zaps me again! I am feeling the stress!! I don't know if I will get a chance over the next couple of days to do another post so I want to wish you all a VERY MERRY CHRISTMAS!!! Thank you so much for all of your friendship, wonderful comments and support over this last year!! I really appreciate all of you--more than you know!! I hope Santa is good to you but more then anything I hope we can all remember the true meaning of Christmas. I hope that during this fun but stressful time of the year we can each take a little time to reflect on the important things in life and all of the things we are grateful for!! I hope you all have a BLESSED CHRISTMAS!!!! 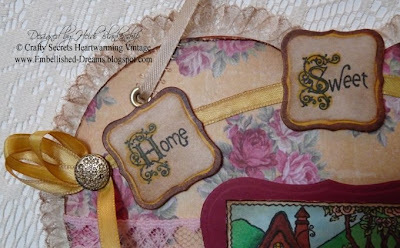 Today is the day for Crafty Secrets NEW RELEASE Home Sweet Home Stamp Set!! I know you are going to LOVE this set!! This stamp set contains 22 stamps! 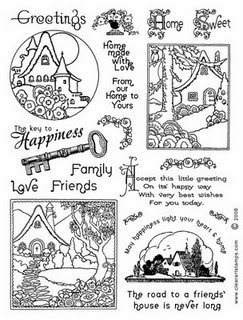 It has sweet little cottages with trees and flowers all around, tiny little flourishes and flowers on a vine along with 12 different greetings and sentiments. 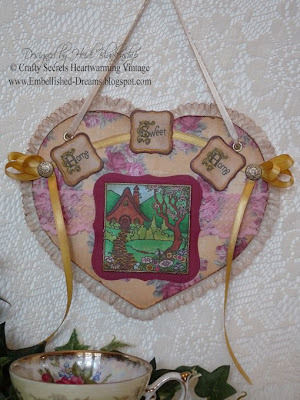 Please be sure to check out the Crafty Secrets Heartwarming Vintage Blog to see several Beautiful samples from the Design Team and to find out all of the details about the PRIZE PACK and FREE GIFTS!!! Here is one of the projects that I made using the Home Sweet Home stamp set. Now I know this isn't the typical color for me, I'm not much of a yellow person. But when I was starting to make this I wanted to make something that could possibly be hanging up in someones kitchen and then I remembered a dear sweet friend of mine who lives in an old victorian home and her kitchen is done in pink and yellow. So as I was looking through the Crafty Secrets Designer Paper Pads I came across this beautiful soft yellow with a pink and rose colored floral print and knew this was the one! It reminds me of her kitchen. Thank you so much for stopping by today!! 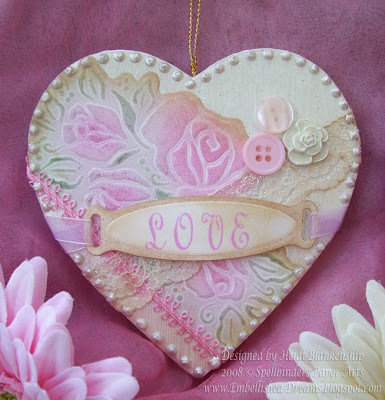 Don't forget to hop on over the the Crafty Secrets Heartwarming Vintage Blog!! 2009 Spellbinders Paper Arts Design Team Contest!!! So did the title grab your attention!?? LOL!! It's that time of the year again, Spellbinders Paper Arts is doing a nation-wide search for talented scrapbookers, rubber stampers, card makers and papercrafters. If you would like to find out all of the details (and see a really great picture from the retreat last year!!) about the contest click HERE!! 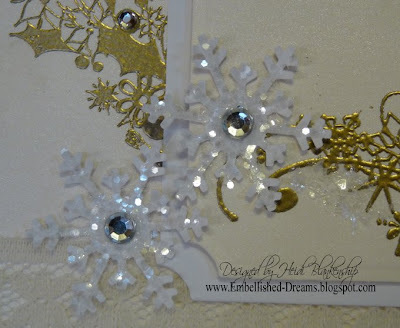 Maybe YOU will be one of the next Spellbinders Designers!! Have fun & Good Luck to all who enter!! I absolutely love how this card turned out! It makes me smile. 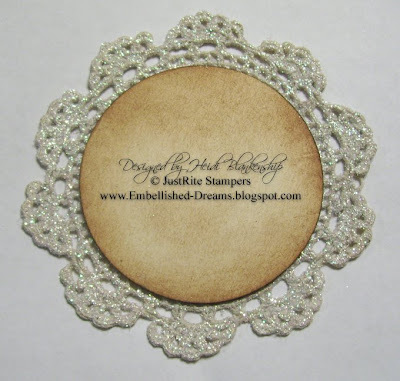 I love the softness of the white and ivory together with a little lace and the sparkle of the glitter, rhinestones and some gold embossing powder. 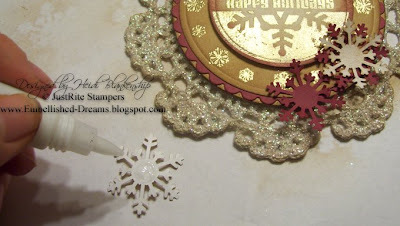 The stamped images are from the Inkadinkado, Winter Birds stamp set and both the bird and snowflake punch are from Martha Stewart. 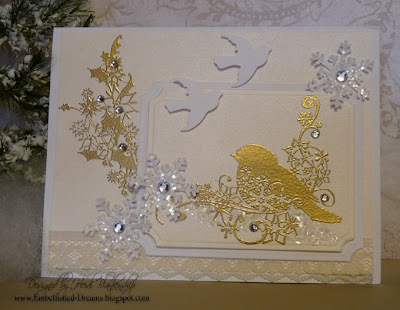 The winter holly flourish was stamped and embossed with gold EP onto the ivory mat with a piece of lace added to the bottom. I used the Wizard and the Labels Large dies (S4-168) from Spellbinders to cut and emboss the label shape from Poison Ivory CS. The bird image was stamped and then embossed with gold EP. I also added a white label to the back for a mat. Then I added the birds, with a little foam tape on the backside to give them some dimension and then the snowflakes were added. For a sparkling final touch I added some glitter and rhinestones. A couple of days ago a sweet friend of my, Mardene (*waving hi*) sent me a link to the most beautiful video and I wanted to share it with all of you. In the email Mardene said, what a beautiful way to start the Christmas season--this will knock your socks off & I have to agree!! Thanks Mardene!! 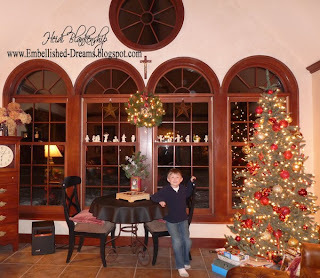 Click HERE to see the video of Josh Groban singing O Holy Night (The Nativity Story). Thank you so much for stopping by today!! 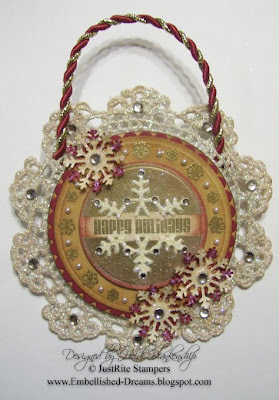 I hope you have a wonderful week and don't forget to check out all of the detail about the 2009 Spellbinders Paper Arts Design Team Contest!! The project I am going to share with you today is one of the monthly design team gallery projects I made for Spellbinders Paper Arts. For my project I altered a heart shaped ornament. The wonderful thing about this project is that you could use it on a Christmas tree or use it for a fun Valentine's decoration. 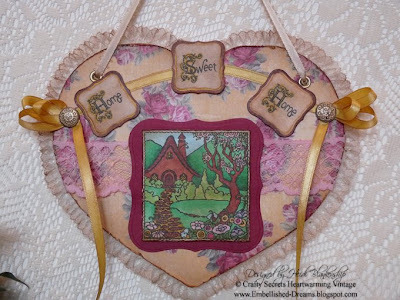 I used two of the Spellbinders dies for creating this design, Rose Borderability Grand (S7-001) and Ribbon Tags Trio (S3-150). 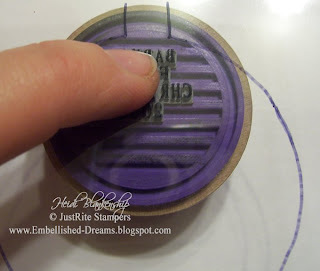 The Rose Borderability Grand is a 12" border die that can be used for scrapbook LO's but you can also use just a small portion of it for your smaller projects. 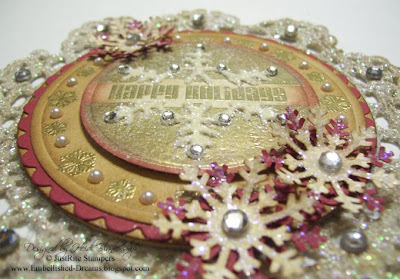 The Ribbon Tags Trio is also a wonderful set of dies, three different tag dies come in the set. To start out I painted the heart shaped ornament with a white acrylic paint and then once that was dry I painted over it with a pearl paint. 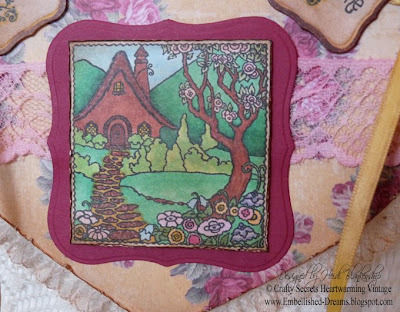 Then I cut and embossed the rose border die using the Wizard and then I colored in the roses and leaves with pastels from The Stencil Collection. I love using these pastels! They are so simple to work with and you can apply them with your finger tips. Then I cut and embossed the tag and stamped the word LOVE in the center. 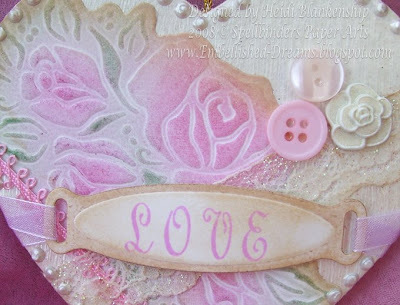 To stamp the word LOVE I used Special Occasions Deluxe Kit from JustRite Stampers along with Orchid Pastel Ink from ClearSnap. 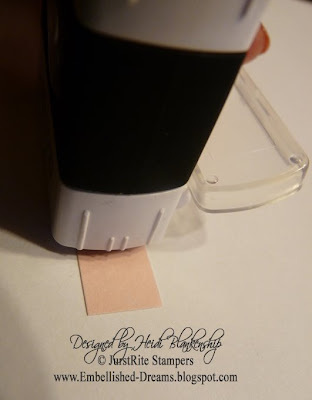 After I had both of the die cuts done then I inked the edges using a combination of Ranger Antique Linen Distress Ink and Creamy Brown Ink from ClearSnap. To apply the roses I used Zip-Dry adhesive from Beacon. I also added some ribbon, lace, pretty pink trim, a few buttons and a tiny bit of glitter. For a finishing touch I edged the heart with little dots of White Opal, Liquid Pearls from Ranger. 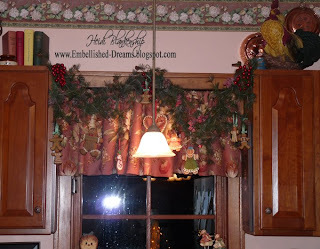 The heart shaped ornament came from Joann's but I am sure you could find them in several craft stores. It's a great way to take something simple and turn it into something beautiful! 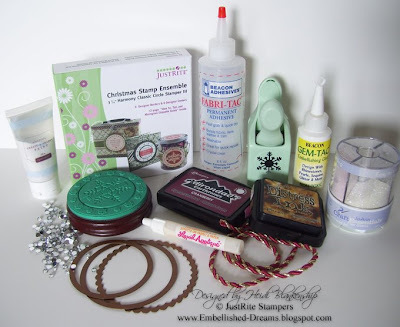 Other~Spellbinders-Wizard, Rose Borderability Grand (S7-001) and Ribbon Tags Trio (S3-150), White Acrylic and Pearl Paint, The Stencil Collection-Pastels, Beacon-ZipDry, Ribbon, Lace, Pink Trim, Buttons, Glitter, Ranger-Liquid Pearls. Thank you so much for stopping by today and I hope you are having a Terrific Week!! 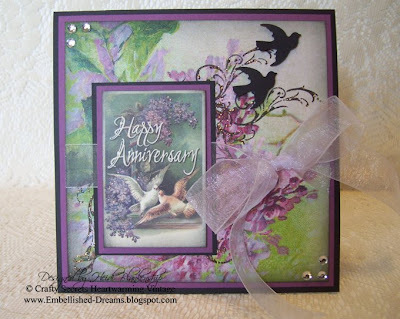 Running with a late night post but here is the anniversary card as promised from the previous post. Yesterday was my Mom & Dad's wedding anniversary--Happy Anniversary Mom & Dad!! I absolutely LOVE how this card turned out!! Both my mom & dad are really big into gardening and they love birds so I knew this combination of flowers and birds would be perfect! They also have tons of lilacs--one of my personal favorite flowers. 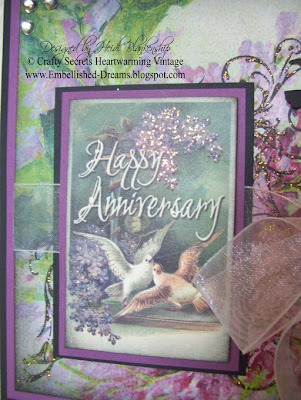 The DP, Vintage Image and the Flourishes stamp are all from Crafty Secrets. 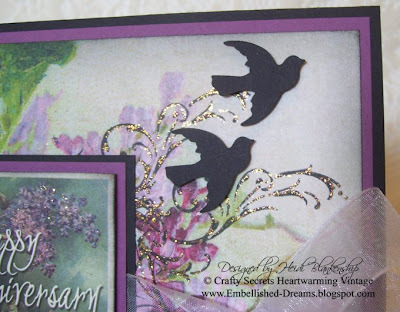 The DP with the beautiful lilacs is from the Radiant Paper Pad. I inked the edges with black ink and then stamped the flourishes from the Cherubs stamp set with the same black ink. I also added Diamond Stickles from ranger to the flourishes. I used the Martha Stewart Bird Punch to punch out two birds with Heritage Black CS from WolrdWin and added foam tape to the back to give them some dimension. The vintage image with the sentiment is from the Joys of Life Heartwarming Vintage Booklets. I inked the edges with black ink and added a little Diamond Stickles from Ranger on the lilacs. All of the CS is from WorldWin, I used Dark Perfect Plum and Heritage Black. 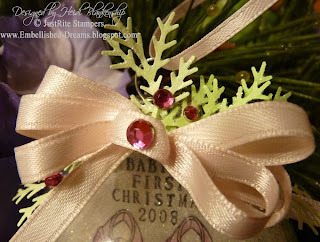 To finish off the card I added a sheer light plum ribbon and some rhinestones. Thanks so much for stopping by! It's *+*snowing*+*snowing*+*snowing *+* here!!! Hope you are staying nice and toasty warm! Have you been having a good weekend and are you staying warm? There is snow on the ground and it's cold here--brrrr. 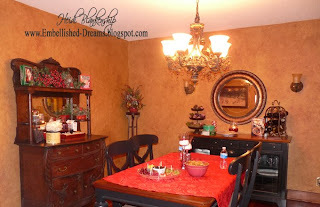 I was inside this weekend and thought it would be the perfect time for some fun holiday crafting. 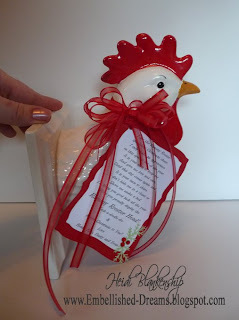 I have a few different projects I have been working on and today I want to share a Christmas ornament with you. 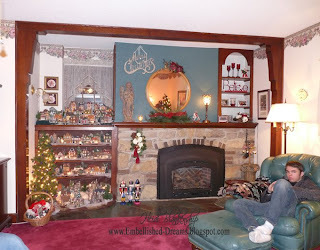 Before I get to the Christmas Ornament I have to ask, how many of you are fans of the Extreme Home Makeover Show? Guess what?? Tonight's show was in my home town and we were there the day that the Devries family came home. I have to say their new home is so BEAUTIFUL!!! I also want to say Happy Anniversary to my Parents!! Today is their wedding anniversary. Thank you so much for stopping by and I hope you had a Wonderful Weekend!! 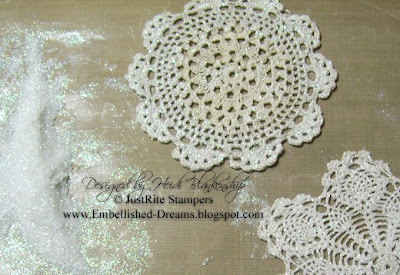 Don't forget to check out the JustRite Stampers Gallery and Blog for beautiful inspiration!